Making money online is not a difficult job if you are using a right approach. But unfortunately, I have seen many bloggers who are working day and night but are not able to generate much income from their blog. The only reason is they don’t know which monetization model to follow. Also Read: OptinMonster Reviews – Why You Should Buy This Lead Generation Plugin? InfoLink is one of the best income sources for bloggers who are tired of getting rejected by Google AdSense. It is one of the leading company in in-text advertising. Also, you can use Google Adsense with Infolinks as well 🙂 So, I thought to write an article on Infolinks reviews. The best thing about Infolinks is it does not annoy visitors through Ads. Also, it does not eat up your website space as the ads are directly inserted in the text. This ad network uses some keywords from a website to showcase advertiser’s ads. These in-text ads will look like normal links to website readers and thus will result in lots of clicks and money to be made for its publishers. The more clicks/ad views you get from your visitors, the more money you will make. Why Should One Go For Infolinks? It serves Text Ads and these are better than banner ads. It offers their publishers more with text advertising and its the most efficient way to make decent money. So when you compare with Adsense or any other big ads tycoons, they mostly focus on Banner Ads. But some people won’t like banners ads and they feel those ads annoy them. So they try to avoid such ads. Also, nowadays users are using Ad-blocker browser extension also so banner ads may not show up on the site; thus decreasing earnings. On the other hand, text ads will be more convenient for all publishers. If you are writing quality content with high paying keywords you can earn decent money. This need to be focused as the ads show their ads with your content niche and the keywords. So the high paying keywords give you more money. Provides various customization options also. You can choose text ads color (text which is selected by Infolinks to show ads and underlining colors) based on your blog theme colors 🙂 This way it will help you to get more clicks. Provides 24×7 Customer Support. In the case of any issues, you just need to send your queries and you will get the solution asap. InFold– Targets only your search traffic with ads relevant to their searched terms in non-disruptive footer ads. InFold adds navigational value and another SEO layer to your site while delivering ads pertaining to exactly what your search traffic is looking for. InText– Double underline your best keywords to monetize your written content. A simple hover of a mouse opens an ad bubble containing an ad matched to the context of your keywords. Fully customize the look and volume of InText ads on your website pages. InScreen: Provides an attractive page takeover that pops up and covers your web page. 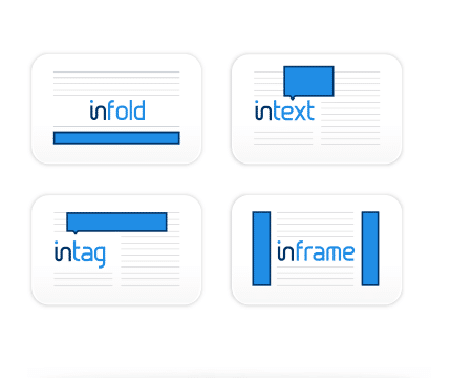 InTag– Presents a range of keywords relevant to the context of your site. Choose between one or two rows of links that open a relevant ad bubble upon a mouse hover. InTag manages to capture a spectrum of users’ interests and invite engagement with its range of keywords. InFrame– Attractive skyscraper display banners placed in the extra real estate in the margins of wide-screen monitors only. These ads are matched to your website’s category and are intelligently revealed only on traffic originating from wide-screen monitors and customized to fit perfectly, without disturbing your site’s layout or user experience at all. Inframe ads are efficient to generate high revenue. InArticle: Infolinks has recently started inArticle ads also. These ads are visible in the content itself when the user scrolls the web page. I have found it very decent and eye-catching. You must have noticed that I am also using these. Also, read the article on ShareASale Merchant Review to know why it is the best affiliate program. How to Integrate Infolinks Ads? WordPress Plugin: All you need to do is install the Infolinks plugin and activate it. Rest it will do all for you. You just sit and enjoy the income coming. Joining the Infolinks Ad network is quite easy and straightforward, its platform is open to any online publisher, big or small, with no setup fees, no minimum requirements for page views or visitors and no hidden commitments. But yes, they do not allow content that can be deemed as negative in nature, illegal or offensive in any way. The baseline here is that they don’t accept anything illegal! Payment Threshold and How Do I receive my Earnings? It has a minimum payout threshold of $50 if you are using PayPal, eCheck, ACH and Payoneer as your payment mode and your earnings need to exceed the minimum payout threshold for your selected payment method before you can receive your earnings. If you have selected Bank Wire Transfer OR Western Union has your payment mode, the minimum threshold requirement is $100. You will get paid once your earnings exceed the payment threshold for your chosen mode of payment. It offers eCheck/Local Bank Transfer facility to Indian publishers as well. Another good thing is Infolinks earnings are far better than many other ad networks out there. Can You use Infolinks with Adsense? Yes, you can safely use Infolinks on the same page where you are monetizing with AdSense. But you have to ensure the pop-up created by hovering the mouse on ads, should not cover AdSense ads. For this you can use <!– INFOLINKS_ON–> and <!– INFOLINKS_OFF–> at the start and end of the content area of your blog. This way ads will be displayed only in your content area part. If you need to stop Infolinks from popping up, you can just go to your account and remove particular ad format. Yes, It is very compatible with mobile devices. Its Ad units are enabled on mobile devices, so you do not lose revenues when your readers access your website via their mobile devices. Infolinks also has an Android/ iOS app that you can install and monitor your Infolinks account and revenues generated with your mobile also. Start Earning money with Infolinks. Infolinks is one of the best alternative to generate revenue from your content.But in this dayswhen technology advances very quickly,there are new ad networks that use artificial intelligence and new optimization technology. Such a network is Tribaladnetwork. I just checked one of your blog posts, I can see Infolinks ads there. So, is it working now? Recently I got approval for my website from Infolink ad Team. Ads are appearing only in Home Page of my site. If I am visiting to particular post of my site then there is no ads. Can anyone suggest me & how to fix this problem. Yes, I also use infolinks with media.net for better income, but both needed high traffic min 500 per day then we can earn from these add networks. I am a professional blogger (http://mlhome.us) and want to earn with infolinks. I have ads set on my blog. Infolinks doenn’t show me good looking colorful ads,, but text-based simple ads. 2. I want to know how does it work: Impressions or clicks? Great Review about infolinks, Thanks and best of luck. According to my experience with Infolinks, their Ads are quite boring and that’s the reason most bloggers don’t use Infolinks Ad Network. However, those webmasters who don’t take care of the visitors or the ads don’t affect site visitors should go for Infolinks. sir really great information . infolinks are best but what about adnow ! is it safe to use adnow in my blog. Thanks a lot for reply. They are showing now after I added PID in plugin settings. After customization is complete, it will show the ads in few hours. To be sure, you can open your page source and check Infolinks code is embedded correctly. Nice review. How long will it take to show ads after done with the customization process??? I have done that and ads are not showing even after an hour.